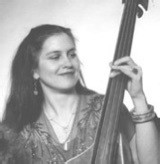 Karen, fiddle, bass and guitar player who played stand up bass with the Belles for many years, also playing beautiful twin fiddle tunes with Delilah. She still returns to play twin fiddles with Delilah at some shows but is very busy playing old-time fiddle these days. Karen is responsible for the great artwork on the Creole Belles CD. The Belles very good friend plays and sings on the final cut of the our CD, the original “Creole Belles.” Lee is a California legend, violin master, great mandolin and guitar player too. He played tololoche, a small Mexican bass, with the Belles for some extremely fun times in the early days and is still playing with many local Mexican, Bluegrass and swing bands.